The first book in a laugh-out-loud funny adventure series for 8+ readers from radio stars Greg James and Chris Smith'So funny, it's almost criminal' INDEPENDENT'Outrageous capers' GUARDIANSHORTLISTED FOR THE WATERSTONES CHILDREN'S BOOK PRIZEA TOM FLETCHER BOOK CLUB PICK Murph Cooper has a problem. His new school is top secret, and super weird. His classmates can all fly or control the weather or conjure tiny horses from thin air. And what's Murph's extraordinary skill? Um, oh yeah - he hasn't got one. Just as well there are no revolting supervillains lurking nearby, their minds abuzz with evil plans. There are!? Right. Ok, then... 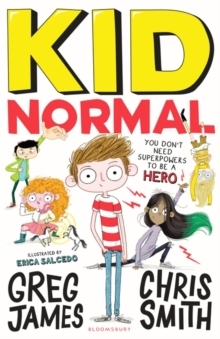 It's time for Kid Normal to become a hero!